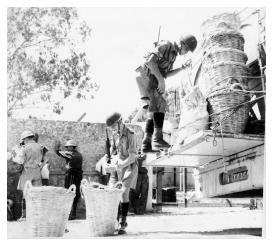 UN Resolution 186 establishes Peacekeeping Force in Cyprus. Battle of the Barn, Liopetri, Cyprus. Searching a bus, a 1 RUR Check-Point operation in Cyprus. 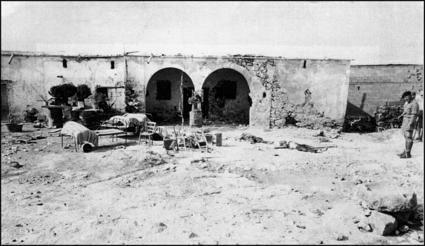 During the Cyprus EOKA Emergency, at Liopetri village, around 0200 hours on 1 September 1958, gunmen opened fire with automatic weapons on elements of the 1st Battalion The Royal Ulster Rifles. The gunmen were experienced Greek-Cypriot fighters from EOKA (Ethniki Organosis Kyprion Agoniston/National Organisation of Cypriot Fighters), at that time engaged in a campaign of terrorism, their aim being independence from Britain and the eventual 'union' (Ένωσις/Enosis) of Cyprus with Greece. The visiting fighters' task at Liopetri was to train local village EOKA fighters in ambush techniques. As an immediate reaction the Riflemen sealed off the village with a cordon, imposed a curfew and began to question the villagers. Unknown to the Riflemen the four fighters had hidden in a barn at the centre of the village which had been searched without revealing their hiding place. The cordon remained around the village and the Riflemen, on receipt of new information, surrounded the barn and called on the occupants to surrender. There was no response but following the arrival of reinforcements the gunmen revealed their position when they opened fire and wounded a Rifleman. Several 36 'Mills' high explosive grenades plus tear-gas grenades were thrown into the barn, but the EOKA gunmen from inside kept up a steady fire through loopholes in the walls. One terrorist was shot dead and tumbled out through the doorway. A 3.5 Rocket Launcher was fired at the the building, which was then attacked by two sections led by an officer. Despite the very heavy fire still coming from within the barn this officer established himself with a group of four Riflemen on the verandah of the house immediately outside the barn doorway. This group was temporarily pinned down by fire and one terrorist came out of the barn doorway firing a sub-machine gun. Corporal Shaughnessy, who had by then expended all his ammo, threw a lump of masonry at the EOKA gunman knocking him to the ground. He then snatched the man’s weapon as another Rifleman fired at the gunman. Cpl Shaughnessy then dragged clear the two wounded, the officer and a Rifleman, then taking one of their weapons attempted to break into the barn. Under cover of his attack the two wounded were removed from the immediate danger area. The two remaining terrorists were subsequently driven out and killed when the barn was set alight. The barn at Leopetri is now a Greek Cypriot national monument and includes a bronze statue of the four EOKA Fighters who chose death before surrender. Cpl Shaughnessy showed complete disregard for his own safety and by his initiative and resource restored what might have become an awkward situation when his officer was wounded. His action in dragging the officer clear undoubtedly saved him from being further wounded and possibly killed. Cpl Shaughnessy's devotion to duty, example and conduct clearly led to the successful conclusion of the operation. In recognition of gallant and distinguished services in Cyprus: Corporal (acting) Patrick Shaughnessy, The Royal Ulster Rifles. For courage, initiative and devotion to duty in attacking a building in the face of heavy terrorist fire. He assisted the wounded and contributed much to the successful conclusion of the operation. 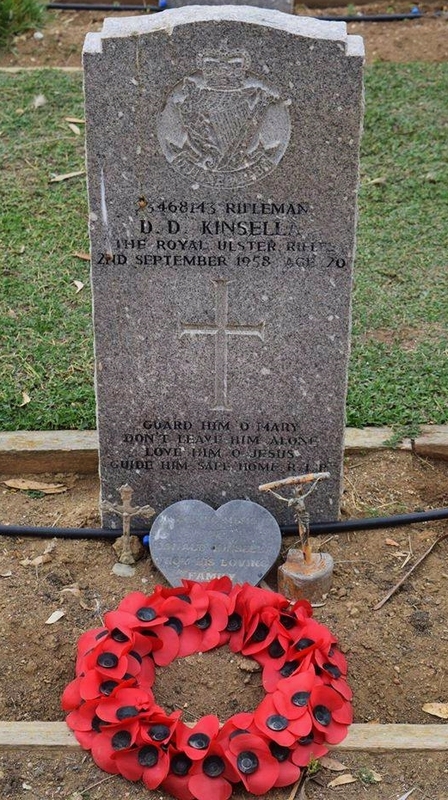 Rifleman Daniel Donald Kinsella died of his wounds and was buried at Wayne’s Keep military cemetery in Nicosia (Plot 11 Row B Grave 10).